This interview with Anthony Thyssen was conducted on the 28th Feb. 2011. 1. What can you remember about your very first kiting experiences? Were you 'right into' the hobby from then on, or did it gradually grow on you over time? As a boy I'd always been fascinated by things that flew. I made my own working boomerangs by filing the airfoil out of some plywood. My first kite was a Peter Powell Stunt Kite, and I remember flying it in the strong winds as one of the famous Brisbane summer storms approached. But the moment that clinched it for me was this yellow and red plastic airplane kite in which the wings rotated. I would peg it to the ground and lie down on the grass underneath just staring at it in the sky. Of course senior high school, and university demands intervened, and I didn't get much time for it after that. At least not until I had my first full time graduate job. I was living in Adelaide then just around the corner from the beach in Brighton, where I started trying to build kites from dowel, plastic, and old umbrellas. Since then I never really stopped flying. 2. As you explored the world of kites, were there any forays into multi-line building or flying? If so, how did single-liners win out in the end? Well I did try to make some stunt kites as a kid. Typically diamond kites with two strings. I can remember finding that wider kites were more maneuverable. Hence my successive stunt diamonds became wider and wider, and naturally more wild, and unstable. But it was all fun. I did make single line kites, but I was actually more interested in trying to build line climbing devices, than flying them. My passion for single lines came later when I returned to Brisbane after Adelaide. Kept seeing these weird old kites designed in books, and just tried to build them. The more unusual the better. UFO rotor kites were my big thing, and in a way they still are. 3. Which of your own designs has given you the most pleasure and satisfaction, and why? Finally getting my first Circoflex to fly, after trying again and again getting it just right, was close. I and many others find them just magical. I still find it a little hard to believe that they actually do fly. The problem is larger ones are temperamental, needing constant attention. So I tend to fly my mini-Circo's (1.2 meter diameter) more. As for the more pleasure. That would have to have been the idea to actually link mini-Circoflexi together to form a flying Olympic Logo. It was great flying it on the Townsville Strand on the afternoon the Olympic Torch was to arrive (see photo). In many ways it set the mood of the whole event, even if I was not strictly part of the organised festivities. 4. You have a particular interest in 'unusual kites', such as Tetras and the Circoflex. Of all these, which individual kite do you think has provoked the most reaction or emotion from onlookers? In what way? Tetrahedral kites are interesting in that you can create what looks like large solid 'blocks' in the sky. But they don't seem to provoke a lot of reaction from onlookers. They are just boring blocks. However they are a rare sight, as they are just so difficult to transport, prepare and put away again. The Circoflex being a reasonably large kite gets more attention from onlookers, most of whom like me can't really believe it is up there! But the best reaction I get from people is when I simply hand someone the kite line of a fast spinning UFO kite (see photo). The unexpected vibrations they feel on the line are just awesome. 5. Tell us a little about the kite which consumed the most build time, of all your own creations. Cumulative or elapsed time, take your pick... Or maybe it was both! My Kite Ball was a 4 meter diameter ball, made from 60 'kite' shaped pieces. This was the final large project I made, before getting hitched. As your readers should know by now, I like the unusual, so when I decided I would build a ball, I did not want just a soccer ball. For this I ended up devoting 6 months of my recreational time, in research, and doing three dimensional studies and computer programming into mathematical spheres. I am overtly mathematical in my thinking and this was going all out. Six months of study, many new programs, and a website of my work, and I finally settled onto a specific mathematical object known as a "Kite Hexacontrahedron". I purchased some ripstop nylon which was the first time for any major kite project. Then started filling my lounge room with large slipper material for three months, before finally finishing the ball. I was disappointed the front ripped out in gale force winds at Bondi a few months later, but the ball came out stronger and more solidly built after that. Since then the Kite Ball (see photo) has been a major feature at any event I attend, with kids of all ages diving underneath as it bounces around. 6. Queensland kite festivals are well known in the Southern Hemisphere and are quite big by any standards. 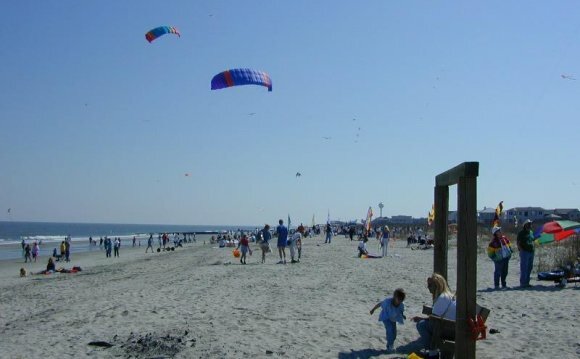 What would you say was the most memorable time you had at one of these events, with your own kite or kites? The second Coolum Kite Festival was in my mind the best festival I ever attended. The first was great, but with that experience the second was downright incredible. It seems to be the way it goes with many festivals. The organizers have gained the experience with the first festival, but have not tried to add too many other things, that start to detract from the experience of visitors. In Coolum this happened to coincide with just about the smoothest, and unvaryingly perfect on-shore winds you could possibly imagine. The kites were so rock steady and well behaved, the flyers were able to literally, rack'em, stack'em and pack'em into the sky, until it was just one mass of kites as far as the eye could see. It was a day that will live in my mind for the rest of my life. 7. Besides your site, no other online source seems to bring together so much information on kite 'messengers'! Can you share one or two top stories of messenger triumphs? :-) Perhaps involving swarms of young children? I have always taken great pride in my web site. I am a firm believer in providing information not available anywhere else. Original material, and without filling pages with just pointers to other places. Given my interest in the unusual, it is not surprising that the main feature is information on UFO's and Messengers. As for swarms of kids. well that just sort of happens. I originally made messengers to drop lollies and Minties. Fantales are good as they have a paper tag you can pierce to attach them to the messenger without needing special bags or holders. But bullies seem to become a problem whenever you have more than one or two lollie drops. The lesson from this is that if you are going to do a lollie drop, do a BIG one, and make sure you have something attached to each lollie so the drop will spread itself over a wide area. But do not repeat. Also have a helper with extra's for the unlucky.